1. What is GSTR 3B? A normal taxpayer is required to file GSTR 1, 2, & 3 returns for every tax period. In case of extension of due dates for filing of GSTR 1 and GSTR 2, GSTR 3B needs to be filed and subsequently if there is any discrepancy between the system generated 3B and earlier filed 3B the taxpayer will have to pay additional tax, liability and other dues. 2. Who needs to file the GSTR 3B? All normal taxpayers and casual taxpayers are required to file the GSTR 3B every time there is an extension of due dates of filing for GSTR 1 and GSTR 2. 3. Where can I file GSTR 3B? 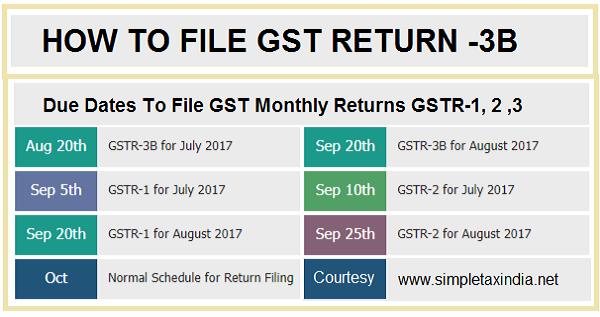 GSTR 3B can be filed from the returns section of the GST Portal. In the post login mode, you can access it by going to Services > Returns > Returns Dashboard. After selecting the financial year and tax period, GSTR 3B, (if applicable), in the given period will be displayed. 4. By when do I need to file GSTR 3B? Specified Due dates for filing of GSTR 3B, 1, & 2 will be notified by the Commissioner for every situation separately. 5. What is the due date for filing the GSTR 3B for the tax periods immediately after the appointed date (July and August, 2017)? 6. Will there be any invoice matching in GSTR 3B? No, all the details in GSTR 3B will be self declared in summary manner and the taxes will be paid based on the table 6 of GSTR 3B (refer to the Rules as available on the GST Council or CBEC website, applicable for GSTR 3B Form). No, all the details in GSTR 3B will be declared in a consolidated manner by the taxpayer and the taxes will be paid based on the table 6 of GSTR 3B, after submitting the return (refer to the CGST/SGST Rules available on the GST council or CBEC website applicable for GSTR 3B Form). 8. What will happen if my declared liabilities in GSTR 3B are different from that of my GSTR 3 which I will file later? Upon generation of GSTR 3, if liabilities are different from those declared in GSTR 3B, the system will update the delta (difference) between GSTR 3B and GSTR 3 automatically. Note: In case of an upward revision of liabilities, you will be liable to pay differential tax along with interest on the (differential) amount. 9. Is filing of GSTR 3 mandatory even if there is no business in the particular tax period? Like for filing of GSTR 1, 2 and 3, GSTR 3B is also mandatory to be filed by all normal and casual tax payers, even if there is no business in the particular tax period. 10. One is required to Confirm after entering data in each section in GSTR 3B. Will the GST System save the confirmed data if a taxpayer exits without completing the form? No, to ensure that the furnished data is saved in a partially complete GSTR 3B, a tax payer is required to click on Save GSTR 3B before closing the form.